<!-Echo and WWVA players including number 21 Ethan Marcum, battle for position during a rebound. HERMISTON - The Hermiston Bulldogs hosted the Kamiakin Braves on Tuesday, December 9, 2008. The game had an ebb and flow as both teams had scoring runs and slowdowns. Hermiston took control early in the first quarter leading 5-2 at six minute mark. At 4:40 Kamiakin's guard Jori Skopik hit a three pointer to tie it up 5-5. That started a ten point run for the Braves while Hermiston was held to four for the remainder of the quarter. Hermiston's Sami Webb hit a trey in the last minute of the quarter. Kamiakin lead at the end of the quarter 12-9. Hermiston took control in the early part of the second period holding Kamiakin to four while scoring seven to tie it up 16-16 at about the five minute point. Malloree Moss started off the period with a three pointer. The Braves crept up on the Dawgs tieing it up at 24-24. Marie Pedro of the Dawgs hit a three at 1:55 which was the start of a burst of points at the end of the half. Hermiston outscored Kamiakin 22 to 14 during the quarter to take a 31-26 lead into halftime. 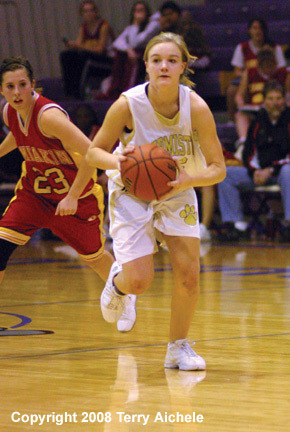 The Bulldogs held Kamiakin to two points for the two minutes of the third. Hermiston scored nine during those first two minutes. Overall Hermiston scored 21 points in the quarter while holding Kamiakin to 11. Malloree Moss hit another three pointer with a minute to go in the quarter. Hermiston finished the period with a 52-37 lead. Hermiston started off the fourth quarter stuck on 52 while Kamiakin scored 11 point to close in on the Dawgs. Hermiston had a 52-48 lead at the four minute mark of the fourth. The Braves outscored Hermiston 16 to 12 but the big cushion the Dawgs hung in there and started scoring again when Mary Shae Hays hit two free throws at the 3:33 point of the fourth. Hermiston turned up the defense slightly while finding their shooting again to out score the Braves in the the closing two minutes. 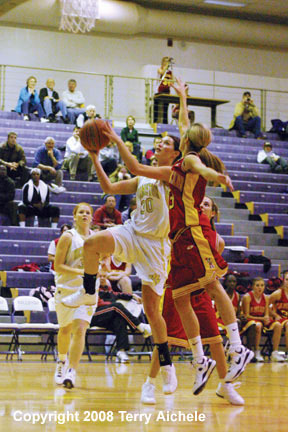 LEFT - Hermiston's Courtney Walchli drives to the basket. RIGHT - Mary Shae Hays of Hermiston goes in for a layup. LEFT - Hermiston's Mary Shae Hays drives in for a layup. 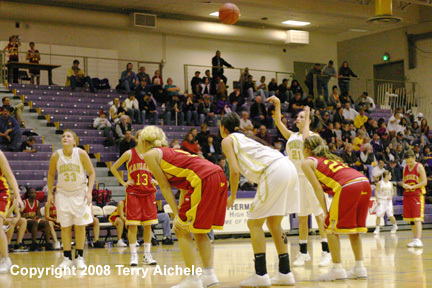 RIGHT - Hannah Whitsett of Hermiston shooting a free throw. 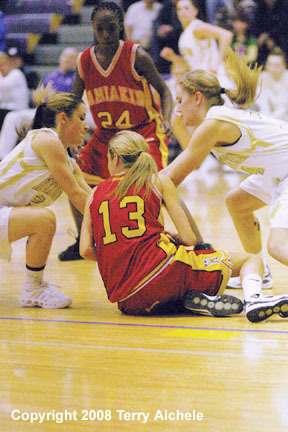 LEFT -Sami Webb left and Kathryn Barnitz, right of Hermiston battle with Tina Miller in the middle of Kamiakin. RIGHT - Sami Webb of Hermiston brings the ball down the court. LEFT - Malloree Moss of Hermiston looks for a teammate to pass the ball to. 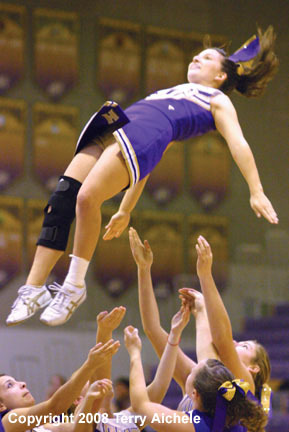 RIGHT - Hermiston cheerleaders prepare to catch a teammate following a lift. LEFT - Kathryn Barnitz of Hermiston. RIGHT - Mary Shae Hays of Hermiston with the ball. Malloree Moss of Hermiston prepares to pass the ball.